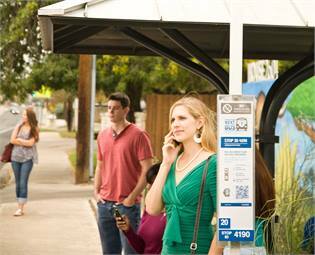 Austin, Texas-based Capital Metro has completed installation of new bus stop signs at all of its 2,700+ stops that make it easy to get specific schedule information on the go using a cell phone. 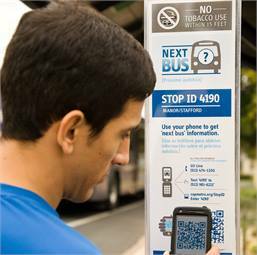 The new signage also furthers Capital Metro’s commitment to creating a healthy environment for riders and employees by prohibiting tobacco use within 15 feet of a Capital Metro bus stop. Use of DadnabTM, the free schedule-via-text messaging service, has increased phenomenally since the signs started going up at bus stops, according to the transit system. In February, users sent text queries more than 100,000 times, and people are scanning the QR codes available at each bus stop an average of 1,200 times per day. “Part of our customer service focus is being responsive to our riders’ needs. What do people want to know when they approach the bus stop? 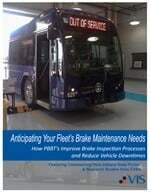 They want to know when the next bus will come,” said Capital Metro President/CEO Linda S. Watson. 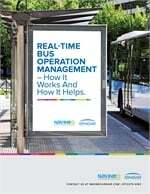 As fewer than 50 percent of bus stops had posted schedule information before the project began, the new system greatly expands the usability of the transit system. Capital Metro also expects to save thousands in materials and labor costs because the signs will not need to be replaced when routes and frequencies change. Braille components will be added to the signs later this summer. With the complete installation of the new signage, Capital Metro is also implementing tobacco-free bus stops, a continuation of its emphasis on creating healthier transit facilities. The passenger boarding areas of Capital Metro’s park & rides and MetroRail stations are already designated tobacco-free. The signage was made possible through a grant from the city of Austin and the national Communities Putting Prevention to Work program. 1. Text: Text the bus stop ID number to DadnabTM at (512) 981-6221, and receive an immediate reply text with the next scheduled bus arrival times for the buses that serve that stop. 2. QR Code: Scan the square barcode on the sign using a QR reader app (many free readers are available from your phone’s apps marketplace), and next bus times and a route map will be displayed on your smartphone. 3. Mobile site: Open capmetro.org/stopid/ from your phone and input your bus stop ID number to pull up a mobile-friendly website with the next bus arrivals. 4. Call the Go Line at 512-474-1200. Use the automated voice system 24 hours/day or talk to a real person weekdays, 7 a.m. to 8 p.m., and on weekends, 8 a.m. to 5 p.m.